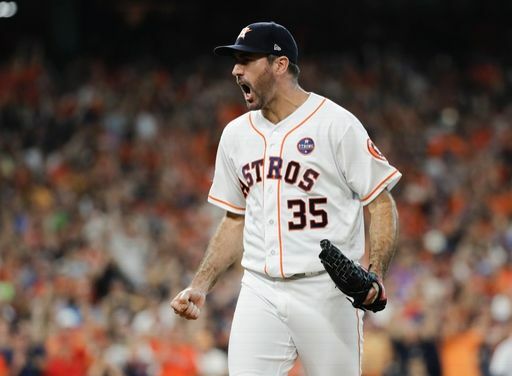 After getting dominated by Dallas Keuchel in game one, it was the same story in game two as Justin Verlander silenced the Yankees’ bats, and another solid Yankee pitching performance went wasted. 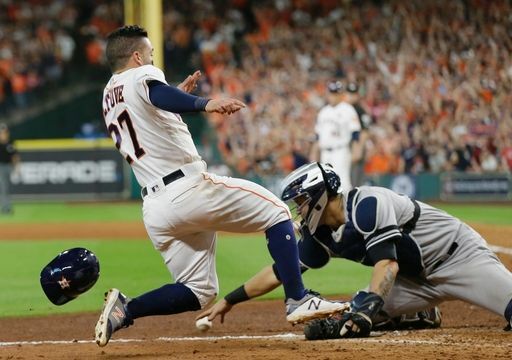 Neither team hit the ball well in this contest, but the Astros got to Chapman in the ninth as Carlos Correa hit a walk-off double to score Jose Altuve from first base. Both starting pitchers came out of the gates firing as neither of them allowed a run to score through the game’s first two innings. The Yankees put some solid wood on the ball in the third inning, but had nothing to show for it. With one out in the inning Chase Headley blasted a ball into deep right field that Josh Reddick leaped and caught at the wall keeping the Yankee DH spot hitless. The following hitter was Brett Gardner and he roped an extra-base-hit down the line. However, Joe Espada got greedy and waved for him to go to third with two outs. Gardner was initially called safe, but was clearly out on the replay resulting in the overturning of the call. Aaron Judge was on deck. The Astros scored first in the bottom of the fourth inning, when Carlos Correa hit a solo home run to right field. Aaron Judge made an awkward attempt at trying to catch the ball, which ultimately ended up in the glove of a young fan sitting in the first row of the right field seats. The play was reviewed for possible interference, but the umpires and replay personnel agreed there was not any. The Yankees answered back with two outs in the top of the fifth. Aaron Hicks laced a two-out double off of Verlander to give the Yankees their first runner in scoring position on the evening. Todd Frazier came through with a double of his own that got stuck on the railing of the left-center field wall. It was ruled a ground-rule double scoring Hicks. Luis Severino would not come back out for the fifth due to what Joe Girardi called “concerns about his shoulder,” and because he got hit hard by a comebacker in the previous inning. Severino should be fine, but the Yankees just wanted to play it safe with a strong bullpen at the ready. Robertson and Kahnle were brilliant in their two inning outings as each allowed only a single baserunner. Unfortunately for the Yankees, Justin Verlander was slightly better. He pitched a complete game effort on 124 pitches, and a whopping 93 for strikes. He struck 13 hitters, and the whole lineup looked completely lost over the course of the game. 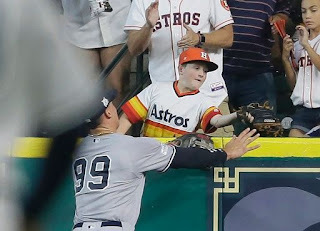 Verlander was rewarded for his brilliant efforts by Carlos Correa in the ninth who laced a walk-off double that was cut-off by Aaron Judge, thrown to Didi who then had to throw over a sliding Correa to Sanchez at home plate. The throw was bounced and mishandled by Sanchez and Altuve scored from first on a ball that didn’t even split the outfielders. The Yankees will look for some more Bronx magic that they enjoyed in the ALDS starting on Monday night. CC Sabathia will get the ball for the Yankees and he will be opposed by Charlie Morton.